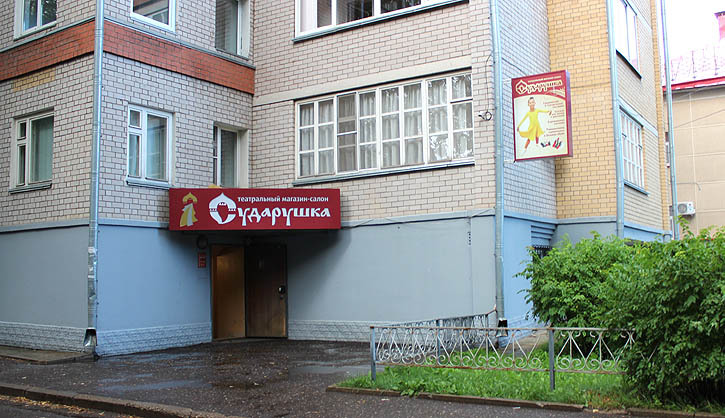 "Sudarushka" store offers a wide range of theatrical costumes, stage and masquerade dresses, dance shoes at Stalnoy Pereulok 3, Kirov. Here you will find and buy the stage costume you are looking for, colorful outfits, dresses for oriental, ballroom, folk and modern dancing, textiles and various accessories, wigs, masks and related products. Our costumes and dance shoes are of our own production, all products are of high quality because we value our reputation and value our partners. We are happy to see actors, dancers and amateurs, representatives of entertainment industry, centers and clubs at our store. Masquerade, an important performance, a holiday photo shoot - in all cases we will help you pick the costume you need. We will help you create your image or add to it. Before Valentine's Day, for example, you will find angel wings and a variety of accessories in our store, on the eve of New Year holidays the range of Ded Moroz (Russian Santa) costumes is significantly updated. You can buy a military suit for Victory Day (May 9). A wide range of products in all sizes of stage and rehearsal clothes and dance shoes is always available in our store. We will help you discover your talents to the fullest!